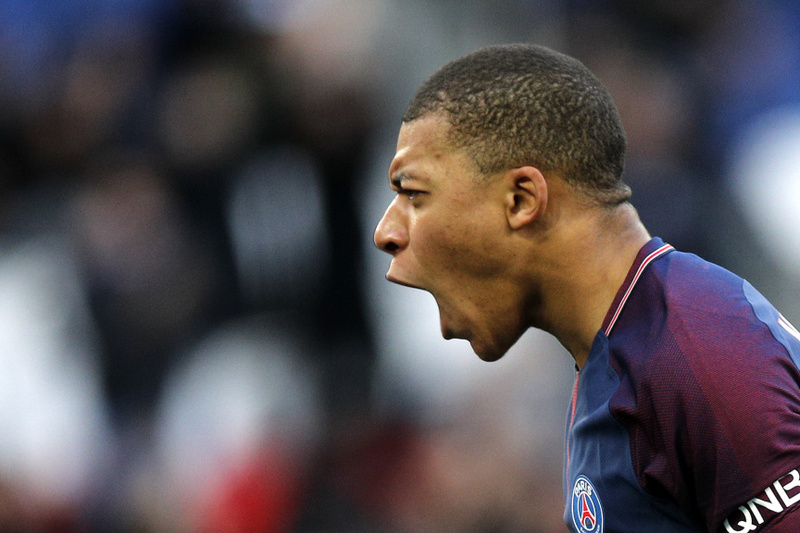 PARIS (AP) — Kylian Mbappe scored twice in the first half as 10-man Paris Saint-Germain beat Angers 2-1 on Wednesday to take another step toward the French league title. The 19-year-old forward has 13 league goals in 21 games since joining from Monaco for 180 million euros ($216 million), making him the world's second-most expensive player behind his injured teammate Neymar. Mbappe is on course to beat his tally of 15 goals last season. The win moves PSG 17 points clear of Monaco, which has played one game less. PSG played with 10 men from the 16th minute after veteran midfielder Thiago Motta was sent off for a dangerous challenge on defender Romain Thomas. Motta jumped up as he rode a tackle from Thomas, but then swiped his studs on the player's chest as he came back down. "He walked on me and it hurt. I'm not sure it was intentional, I wouldn't go that far," Thomas said. "The referee made his decision, that's the way it goes." The home side was already 1-0 up following Mbappe's 12th-minute goal, and went further ahead at Parc des Princes in the 26th when Mbappe crisply side-footed home left back Layvin Kurzawa's cross. Striker Karl Toko Ekambi pulled a goal back with 15 minutes left, starting and finishing the move for his 15th goal of the season. He won the ball near the center circle, fed midfielder Flavien Tait on the right, and took Tait's return pass before sliding the ball into the bottom corner. After Mbappe hit the crossbar in the 83rd, Toko Ekambi twice almost equalized but dragged his shot wide from an angle and then saw his last-minute shot well saved by goalkeeper Kevin Trapp.